In the one-shot Spider-Man: The Osborn Journal, Norman unveiled the various ways in which he had infiltrated the life of Peter Parker while remaining safely hidden in Europe. However, with MJ reaching the final term of her pregnancy, Norman decided to return to New York and destroy his adversary's life in the process. Norman's official return to the Spiderverse was featured in a story arc that ran as a four-part multi-book crossover appropriately named Revelations. When Ben Reilly (aka Peter's clone) returned to Peter's life after being in exile for five years, the web-slinger's world was turned upside down as the two struggled to determine who was the true Spider-Man. Eventually it was revealed that Ben was the real Spidey whilst Peter was actually a clone. Enter: The infamous Clone Saga II. Long story short, throughout the Clone Saga it became clear that there was a mastermind who had been pulling the strings the whole time...and that mastermind was first shown with a shadowed appearance in Amazing Spider-Man #412. The mastermind, of course, was Mr. Norman Osborn. 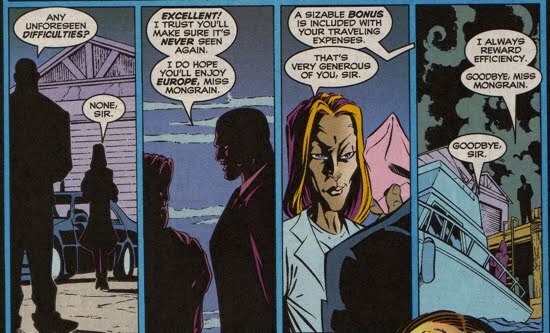 In part one of Revelations, featured in Spectacular Spider-Man #240, Osborn pays a visit to his lackey Seward Trainer and encourages the scientist to speed up Gaunt's rejuvenation process. He informs Trainer that he needs Gaunt to carry out some "preliminaries" as his plot against Peter Parker and Ben Reilly unfolds. 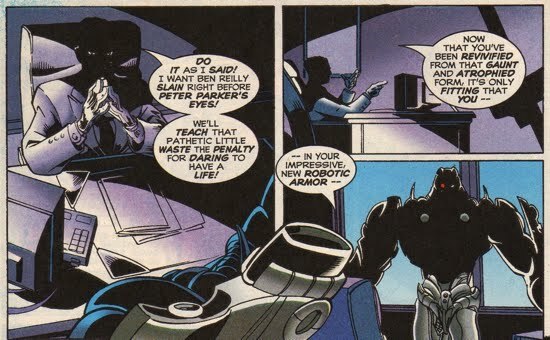 This marks the first time Trainer discovers the identity of mastermind behind Gaunt and the Scriers, and he immediately realizes that he has to tell Peter and Ben everything he knows (technically, Trainer was present during the scene in Amazing Spider-Man #412, so he should have realized that Norman was the mastermind back then...but I digress). 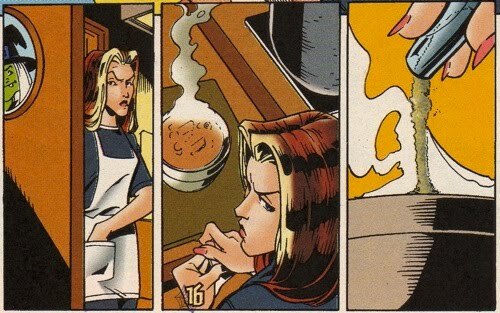 Meanwhile, Alison Mongrain (an Osborn operative) takes a job as a waitress at the local coffee shop, The Daily Grind. This happens to be a restaurant that Peter, MJ, and Ben visit frequently. Since Trainer is now aware of the mastermind behind the deception, he is targeted by Gaunt as a liability. Trainer is on the run for his life. Gaunt's rejuvenation is complete and his body is now encased completely in robotic armor, so from this point on he will be referred as the Robot Master. The chase leads Trainer right into the hands of Norman Osborn, literally, and Osborn kills the lackey instantly. He then informs the Robot Master to dispose of Trainer's body. Sensational Spider-Man #11 contains part two of this saga and it commences with Norman, whose identity remains mysterious at this point, telling the Robot Master to kill Ben Reilly. 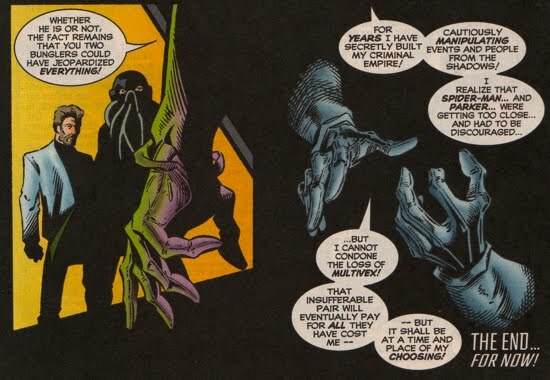 Osborn tells his robotic partner that he wants Reilly murdered in front of Peter Parker and he insists that Parker be kept occupied and away from his wife while Norman executes the remaining aspects of his plan. As a subplot, J. Jonah Jameson, Joe Roberston, Ben Urich, Flash Thompson, Betty Brant and a few others receive invitations to a gathering at the Daily Bugle at midnight that evening. The invitation for Jameson is signed by the sender as "O". Elsewhere in New York, Arthur Stacy, brother of deceased police captain George Stacy, returns from Hong Kong to pursue Spider-Man as a suspect in the death of his brother. Meanwhile MJ, who happened to be dining at The Daily Grind, orders up a chicken gumbo from her waitress...Ms. Alison Mongrain. Mongrain places some sort of chemical additive in the form of a solid powder to MJ's food. This immediately results in MJ going into what the EMT's referred to as a 'severe and complicated labor'. Meanwhile, Peter and Ben are distracted as they battle the Robot Master and his group of "children" robots. The action continues in part three of the saga, featured in Amazing Spider-Man #418, as MJ is in labor while Peter and Ben continue fending off the Robot Master's attack. Peter had received a "911" page from MJ, so he was aware that she has gone into labor. Regardless, he continues to help Ben until the threat of the Robot Master was diminished. 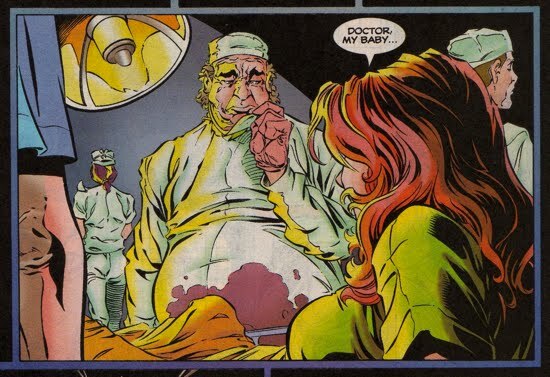 Meanwhile, at the hospital, MJ is greeted by Dr. Folsome and he informs her that her regular doctor is "out of town". 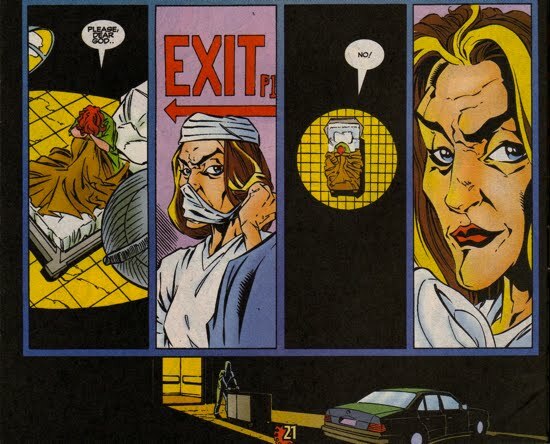 Angela Yin, a photographer for the Daily Bugle who happened to be at the hospital, noticed the odd circumstance and the fact that Peter was not present. She relays that information back to Joe Robertson at the Daily Bugle, who immediately empathizes with his former colleague. Soon after, Norman oversees the deliver of MJ's baby in person, making sure that everything goes 'exactly as planned'. Dr. Folsome and Alison Mongraine were both present in the delivery room. 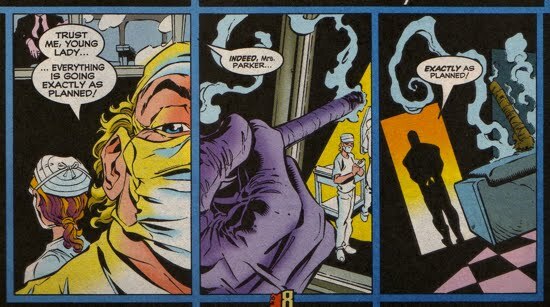 Osborn and his henchmen had infiltrated the hospital as a part of his maniacal plan against Peter and his family. Just how many of these 'hospital employees' were actually Osborn operatives and how Osborn was able pull off such a task at a public hospital were both unclear. Across town at the Daily Bugle, more Osborn operatives were installing explosive devices (disguised as pumpkins of course!) throughout the building. Eventually Ben Reilly was able to dismantle the Robot Master and his minions, but not before both he and Peter were exposed to a Green Goblin-designed 'Spider-sense dulling' gas. Norman used a gas similar to this on Peter in Amazing Spider-Man #39. As Ben demands the identity of the mastermind from Stromm, Norman emerges and informs Reilly, "why ask the underling…when you can go directly to the source?" Norman then immediately knocks the former Scarlet Spider unconscious and 'kills' (again) the Robot Master for "his failure". Back at the hospital, MJ is informed that her baby did not survive birth. As MJ sat mournfully in her hospital chair, Alison Mongraine unsuspectingly rolled a cart out of the hospital en route to a meeting with her employer. Mongrain received a sizable bonus from Osborn for her 'efficiency', he then sent her off on a boat to take refuge in Europe. Alison was instructed to make sure 'it's never seen again'. Exactly what 'it' is, is still unknown to date, but one could strongly suspect that it had something to do with Baby May. Whether the baby survived the birthing process also remains unclear to date. 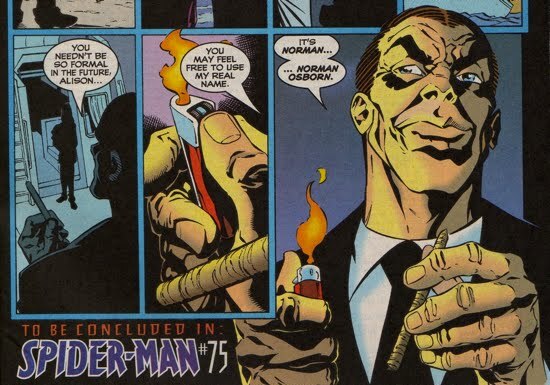 It should be noted that the final panel of Amazing Spider-Man #418 contained the official return of Norman Osborn to the Spiderverse, as the original Green Goblin casually lit a cigar in celebration of his success. The final installment of the Revelations story arc is featured in Peter Parker Spider-Man #75. The story begins with Norman keeping tabs on his grandson, Normie, as the young Osborn is out trick-or-treating with his friend. Normie accidentally bumps in to his grandfather (unbeknownst to Normie that it is Norman), accepts candy from the stranger (a big no-no!) and then quietly walks away questioning whether or not that was his grandfather. Soon after, Peter arrives at the hospital to be by his wife's side but was surprised to find that there was no record of his wife being admitted. When he reaches the maternity ward, Dr. Folsome informs him that “there’s been a problem”, he then sedates Peter. Meanwhile, J. Jonah Jameson, Flash Thompson, Liz Allan, and others are gathering at the Daily Bugle because they have all been mysteriously invited from different sources to attend a party. The group soon realizes that something is not right and that they have been trapped. As Peter awakes from sedation, Norman reveals himself to his long time adversary. Finding himself in a profound state of disbelief, Peter could not fathom that Norman was somehow still alive. 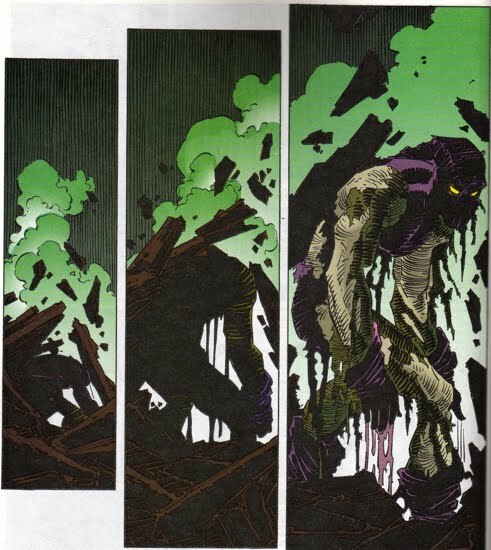 But the villain explained that the Green Goblin Formula had provided him with a remarkable healing factor, which staved off the death-blow from his Goblin Glider. For more on Norman's profound resurrection, see HERE. 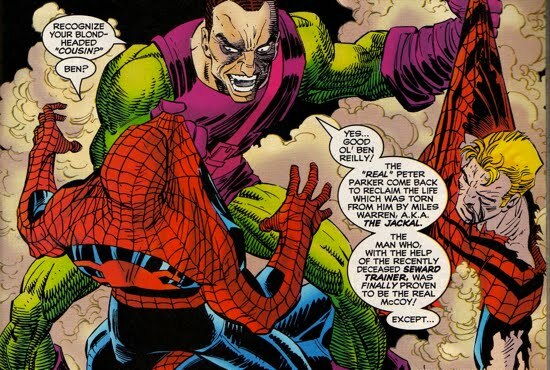 Osborn's return to Peter's world was prompted by the fact that he had tired of Peter rebounding from all the things he had thrown at him and he wanted to exact his final revenge on the web-slinger. 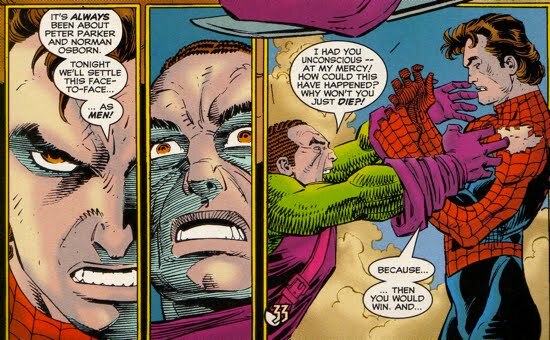 In exchange for killing his son, Osborn wanted to take Peter's life...take Peter's everything (ie, he wanted to kill everyone close to Peter). He also informs Peter that Ben Reilly was actually the clone, not Peter. He then leads Peter to the Daily Bugle so that he could watch him kill “all those close to him”, before he kills Peter as well. The Bugle was right across the street from Osborn's hideout, which is where both Peter and Ben were located. Osborn, now fully garbed as the Green Goblin, terrorizes his hostages at the Daily Bugle. He smacks his daughter-in-law, Liz Allan Osborn, after calling her a cow and nearly drops J. Jonah from high above the city skies. All of the hostages realize that Norman Osborn has returned from the 'dead' and the entire city watches as the Green Goblin and Spider-Man battle-it-out above the Daily Bugle. 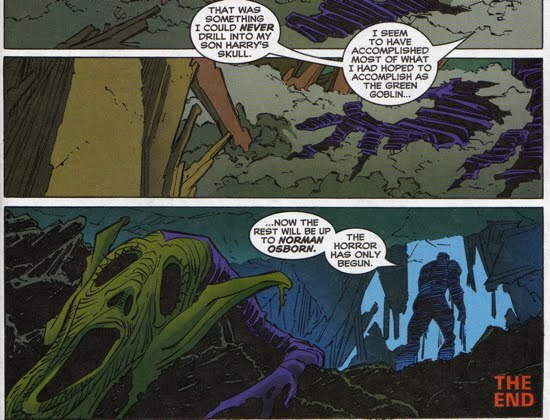 The Goblin taunts Spidey and even chastises his deceased son Harry for letting 'this costumed buffoon kill [him]'. But Peter was able to keep his cool as he encourages the Goblin to take off his mask and for them to battle it out as Norman and Peter, not the Goblin and Spider-Man. 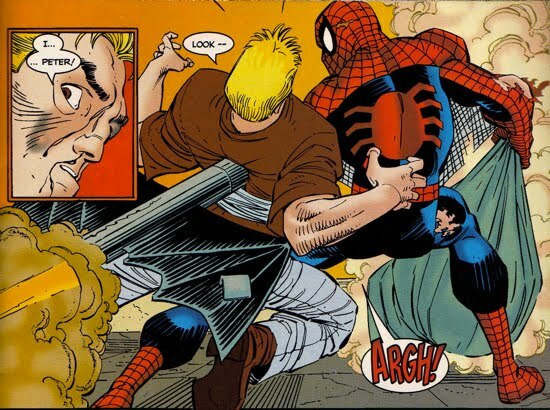 However, Osborn loses his temper and he attempts to strangle Peter, this gives Peter the upper hand allowing him to land a few solid punches that essentially KO Osborn. Meanwhile, Ben Reilly sneaks the hostages out of the Daily Bugle, and makes his way to Peter, who has neutralized the Goblin. But Norman was not about to let it end in that manner, instead, he activates his Goblin Glider via a control on his wrist, sending it toward Peter. In a last ditch effort to save his brother, Ben is killed when he steps in front of the glider, leaving the former Scarlet Spider mortally wounded. The glider impales him and he falls from the top of the Daily Bugle building onto a parked car. 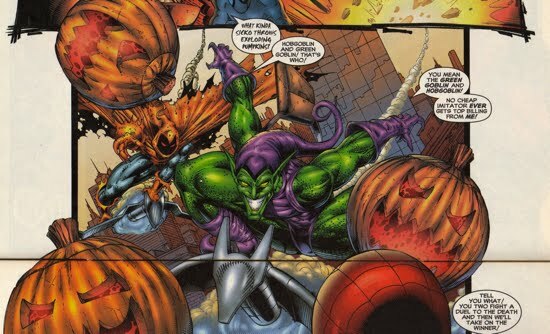 Peter hurls a bag of pumpkin bombs at the Green Goblin, which explode when they hit him, and the Goblin vanishes out of sight in a fiery blast. 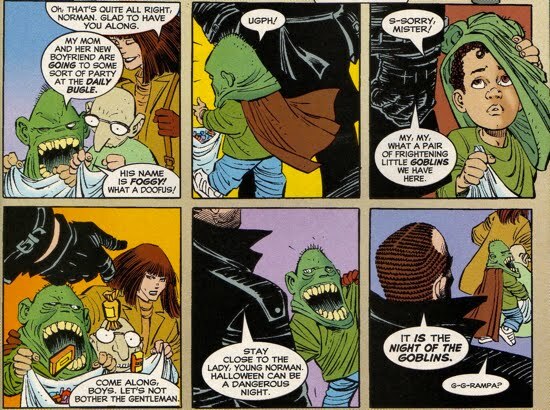 As the Goblin's image fades, he reminds Peter that he can never kill him and that he has "no idea what [Norman has] taken from [Peter]". Norman is most likely alluding to the abduction of Peter's baby daughter May. Soon after, Ben Reilly dies and his body disintegrates, revealing him as the true clone. Peter does not find Norman's body, but he knows that he has not seen the last of his mortal enemy. In the trade paperback Spider-Man: Revelations an epilogue is added to the battle between Spider-Man and the Green Goblin. In that epilogue, Norman is seen emerging from the rubble left behind from the exploding pumpkin bombs. He then vows his revenge against Parker and claims that "the rest will be up to Norman Osborn." 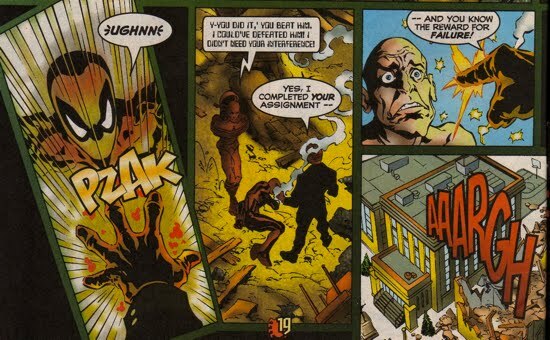 The trade paperback also included scenes that featured Norman beating the life out of Ben Reilly just prior to Reilly's attempt to save the hostages at the Daily Bugle. Those extra scenes provided more context to Ben's bloodied face at the beginning of Peter Parker Spider-Man #75. After his return from the shadows and subsequent attack on Peter Parker, Norman went back into hiding for brief time. 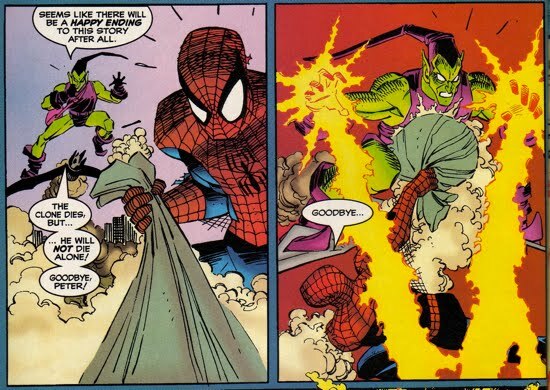 But that didn't mean the end of the Green Goblin, in the two-part mini series Spider-Man Badrock the Green Goblin returned. 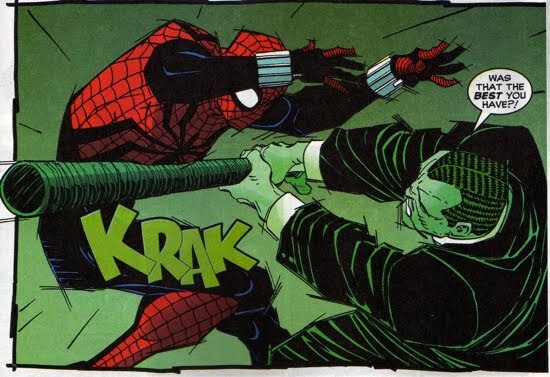 In fact, Spider-Man and Badrock were attacked by both the Green Goblin and the Hobgoblin at once. Spidey would soon realize that his attackers were not the true villains, rather illusions employed Mysterio. In a later scene, Mysterio describes his creations as 'holographic constructs empowered with the abilities of the authentic matrix individual' (whatever that means!). So technically this wasn't Norman Osborn, but it does point to a connection between he and Mysterio. According to Amazing Spider-Man #581, Norman was aided in faking Harry's death by Mysterio, which suggests the possibility for different types of collaboration between the two villains. Could Osborn have worked with Mysterio to develop these authentic matrices? I guess we'll have to wait and see.